Do you want to add multiple authors to your blog? WordPress comes with a built-in user management system that allows you to add users with different roles and capabilities allowing you to add new users without worrying about the safety of your site. In this article, we will show you how to add new users and authors to your WordPress blog. There are two ways to add new users on your WordPress site. You can open your WordPress site for user registration, or you can manually add users. The first method will allow anyone to create an account on your website. This method is useful when you want to invite a lot of people to join your site. However, if you just want to add a few users, then you should add them manually. 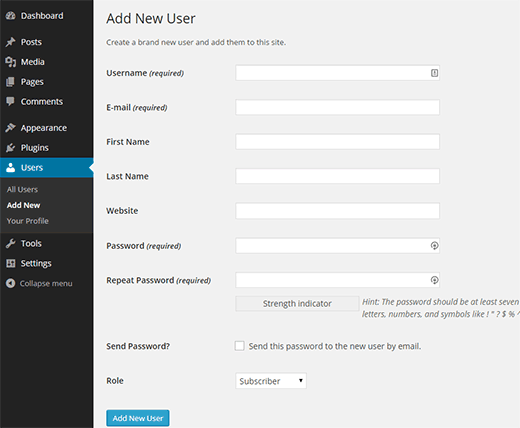 To add a new user on your WordPress site, simply click on Users » Add New and fill out the form. First you need to provide a username, use something that is easy to remember for the user you are adding. They will need to remember the username to login. A good strategy is to use the first letter of user’s first name with their last name. For example, tgriffin, jsmith, etc. Next you need to enter the user’s email address. Double check the email address, as users will need this in order to reset their passwords, or to receive email notifications. You can enter first name, last name, and website information. However, these fields are optional and users can edit their profiles to fill in those fields. The next item in the form is to choose a password. You must use a strong password. We recommend using an online strong password generator for this purpose. Below the password fields, you will see a checkbox which you can check to send the password to the user via email. The users will receive their login information on the email address you entered above. The last option on the page is to choose user role. Each user role comes with different set of capabilities. Subscriber is the least powerful role, and administrator or network admin is the most powerful role. You need to choose a role depending on what tasks a user will be performing on your website. An administrator can perform all tasks on your WordPress site. It is highly recommended that you do not assign this role to any user unless you trust them. With administrator user role, a user can install plugins, change themes, delete content, media, and other users including other administrators. If you just want to allow a user to add posts, and edit only their own posts, then you can use the contributor user role. Users with the contributor user role can write posts but cannot publish them. They cannot edit other user’s posts and cannot access other admin screens like plugins, themes, settings, tools, etc. On the other hand, if you want to allow someone to not just add posts but also publish them, then author user role is perfect for that situation. Users with the author user role can add, edit, and publish their own posts. To give a user complete editorial control on your website, you can give them editor user role. Users with the editor user role, can add, edit, publish, delete their own posts as well as posts by all other users as well. They cannot access website settings, plugins, themes, etc. A subscriber can just maintain their own profile on your site and cannot write posts. It is usually used on sites where users are required to sign in to submit comments or download content. As an administrator, you can add and remove users from your WordPress site at any time. You can also edit a user’s profile at any time and change any information including passwords. Simply click on the Users and edit or delete a user anytime you want. For more adventurous users, there are other options where you can extend and customize the functionality of the WordPress user management system. You can add or remove capabilities to user roles or even create custom user roles. You can add additional fields to user profiles, add an author bio box, display an authors list, and so on. 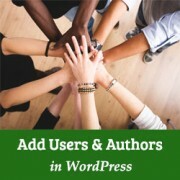 We hope this article helped you learn how to add new users and authors to your WordPress site. Where do the users I add go to log in once I’ve added them? Is there a way to send a bulk email to all the Users with Author or Admin access containing their login details? Somе genuinely superb articles οn this website, thank үoᥙ foг contribution. guidance fгom someone ԝith experience. Αny help ѡould Ьe enormously appreciated! Yes they have WYSIWYG editor to write your content. You don’t need to add HTML unless you want to. Respect. How to add a user who will be able to see what I (as administrator) is a complete control panel but without the ability to add, change or delete – but just review what I did. This is what I need to keep a look at the layout of the site and point to the possibility of solving the problem I have. Thank you! Users will only be able to see the areas where they can make changes. For example, if you want them to be able to see theme settings, then they will also be able to modify them. Hi, I just employed someone to my blog and added him as a user. I don’t want him to have access or to be logging in to my site dashboard with the main details. How can I make him have his own log in details or which link would lead him to the dashboard as an Author? hello. i have been added to be a user administrator to another wordpress account, however i’m not able to see that website under my profile. i have to go on to the website and login everytime i need to contribute something. is there anyway i am able to see said website under my profile or on my dashboard to access it easily? How do I add an authors name so I can credit them for guest posts, without actually giving them access to my site? Please see our guide on how to add guest author name with custom fields in WordPress. Hi, is it possible to add an existing WP user to a site using their gravatar or WP login? I have been added to a clients site in this way but I don’t know how they achieved it (I received no email or new password etc). Yes, they can do that. Unfortunately, there is no way to stop this from happening. If they added you without your permission, then you can ask them nicely to stop. If they have used your Gravatar profile to publish content, then you have the option to take legal action. You can send them a cease and desist notice. Thanks – it’s not a problem. In fact, I want to know how to do it for my own WP sites! And for future reference with other clients. When I go to “Add User” it wants a password set up. But I was able to access their site with my own WP login info. How is it done, please? They can add your login email but they cannot add your password. You can go to Add New User page and select the checbox next to ‘Send User Notification’ option. Make sure that you don’t click on show password button. This way users will receive an email notification to set their password and login. Best way to do this is by choosing a mobile friendly WordPress theme. Check out the showcase section on our website for our theme lists. All themes in those lists are mobile responsive. We are glad you found the article helpful. You may also want to subscribe to our YouTube Channel for WordPress video tutorials. your authored material stylish. nonetheless, you command get bought an shakiness over that you wish be delivering the following. Please take a look at our guide on how to schedule WordPress posts for social media with Buffer. It allows you to automatically share new posts from your blog to Twitter, Facebook, and LinkedIn. thhe blog. Any feedback would be greatly appreciated. a bit up very fast! What host are you using? Can I get your associate hyperlink in your host? Our website is hosted on a dedicated server with HostGator. associate hyperlink on your host? I want my site loaded up as fast as yours lol. get guidance from someone with experience. Any help would bee greatly appreciated! WordPress comes with an easy to use WYSIWYG editor called Visual Editor. It also comes with a text editor for more advanced users who want to write plain HTML. New Uses and Authors to Your WordPress Bloog <Liked it! After adding a user, what password does he use? We are using WordPress for this website. We use WordPress for all our websites. As for security, you may want to see our WordPress security guide to protect your website against hackers. Please check out our WordPress SEO guide for beginners. Please see our guide on how to start a WordPress blog. The cost actually depends on how fast your site grows and how much you want to invest on it. New Users and Authors to Your WordPress Blog is kinda boring. I feel like this is a stupid question but…I have added a user. How do they log in to post? The username and password I set up for them isn’t working to log into wordpress. Your user can also click on the ‘Lost Your Password?’ link to reset the password. This may be a stupid question – I’m setting up a multi-author site, I have clicked ‘anyone can register’ and have set up registration with both profile builder and with wp-members. People who register are automatically assigned ‘contributor’ status. However when I am logged in as a fake user, the admin panel doesn’t appear – in short, my question is – how do contributors contribute?! Good video except for one thing: being a neophite, I’m not sure how to get to the ‘general settings’ bar in order to do all those things. I want to add users. Thanks! This is so useful, The blogs I manage are increasing in number, and giving others one of these roles is awesome. Thanx. Thank you for sharing the video. I found it very helpful!